a. What benefits do I enjoy with a Theatre Card? · Priority - we give you priority access to tickets before they are released to the general public. · Ticket offers - with opening night ticket offers up to £10 off and half price, your ATG Theatre Card can pay for itself in one visit. · No booking or postage fees - we waive booking, transaction and postage fees on most productions for our members. · Priority brochures - members always receive their new season brochure ahead of the general public. · Exchange your tickets - if we have seats available, we can exchange your tickets for another performance, without charging you extra. · 10% discount - use your Theatre Card at our bars and save 10% on all drinks. · Restaurant and visitor attraction offers - we have a range of offers from our partners, including 10% off your food bill, free glasses of wine, and reduced price entry to visitor attractions. Click here to see our latest offers. i. How many discounted Theatre Tickets can I buy in a transaction? You can book 4 discounted tickets per Theatre Card, per performance. Additional tickets for that performance will have to be bought at full price though these will not have any booking or transaction fees, unless fees apply for that show. Please see our Theatre Card T&Cs. ii. What is my membership number? Your membership number is unique to you as an ATG Theatre Card member and can be found on the front of your Theatre Card. We will also reference your membership number in any written correspondence that we send to you. Remember to quote your membership number if you are booking over the phone, or if you are booking online for shows with Theatre Card discounts, after clicking 'Select Tickets', choose the 'Theatre Card Members' option and then enter your membership number to take advantage of available offers. iii. I haven’t received my Card yet. When will it arrive? Please allow up to 28 days to receive your ATG Theatre Card. If you have not received your card by then please call us on 020 8544 7469 (Calls cost 7p per minute, plus your phone company's access charge) and we will send a replacement to you. iv. Can I get a replacement Theatre Card if mine has been lost or stolen? If your card has been lost or stolen, please call 020 8544 74690844 871 7633 (Calls cost 7p per minute, plus your phone company's access charge) and we will issue you with a new card. v. Can I buy a Theatre Card and use it immediately to make my ticket purchase? If you are purchasing over the phone or at the box office your membership will be activated immediately. If you are purchasing online please allow 48 hours before booking whilst we upload your membership number to our website. vi. Can anyone else use my Theatre Card? No. Your ATG Theatre Card is non transferrable as per our Terms and Conditions and is exclusive to you. We can retain your Theatre Card as per our Terms and Conditions if we believe you are using you card in this way. vii. What do I do if the discounts promised don’t register on the checkout? Please check that the performance you have booked for has a valid ATG Theatre Card offer. If the offer is not showing online then please call us on 0844 871 7633 (Calls cost 7p per minute, plus your phone company's access charge). viii. Why am I being charged booking fees if I’m an ATG Theatre Card member? Additional bookings fees may apply on selected music, comedy and named act events, or for productions at non ATG venues. Please find a full list of ATG venues here. Our booking fees policy for Theatre Card holders is outlined in our Theatre Card T&Cs. ix. Which theatres can I use my ATG Theatre Card at? You can use your ATG Theatre Card at all 38 of ATG’s venues including our theatre on Broadway in New York, The Lyric Theatre. x. How do I find out more information about the Theatre Card discounts I can get? 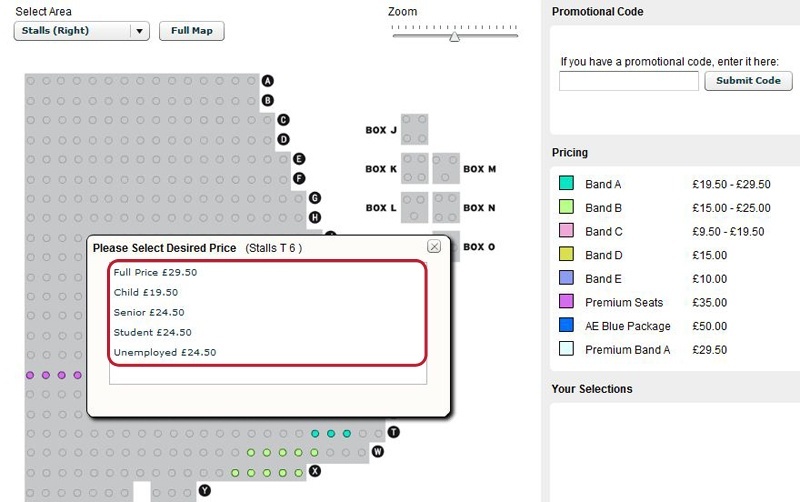 If you go to the page of the show you’re interested in seeing, click on ‘Select Tickets’ and a drop down will reveal all. If there’s a Theatre Card deal, it will come up here. Some deals only work for some performances, so it’s probably worth checking out a few date options to get the best offer. There are three easy ways to purchase your Theatre Card. · At your nearest venue Box Office: Click here to find your nearest venue. ii. How do I renew my Theatre Card? Renewals can be made in exactly the same way as new purchases. · At your nearest venue Box Office: Click here to find your nearest venue. · Post: We will write to you to remind you to renew your Theatre Card. Simply choose your method of payment and return the form to us. iii. How do I buy a gift membership and how do they work? If you would like to buy an ATG Theatre Card for your friends or family then you can purchase an ATG Theatre Card Gift Voucher online, in person at your nearest ATG theatres Box Office, or by calling 0844 871 7633 (Calls cost 7p per minute, plus your phone company's access charge). The ATG Theatre Card Gift Voucher comes in its own pack and includes details of how to redeem your voucher for a membership. ATG Theatre Cards can be used or bought at any of ATG's theatres. Here's a full list of ATG's theatres. i. How do I pay by Direct Debit? Direct Debit is the easiest way to pay for membership and keeps your membership current and up-to-date all year round. If you are a new member, you can set your Direct Debit up here. If you want to renew your Theatre Card membership, you can do so with Direct Debit here. ii. What is the Service User Number stated on my Direct Debit confirmation? The Service User Number is a unique six digit number allocated to ATG Tickets to prove that we are authorised to process Direct Debits. It is not your membership number. iii. What is the reference number on my confirmation email? This number starts ATG0000 or AMB 0000 and it is your unique reference number which helps us and the bank refer to your Direct Debit for your ATG Theatre Card membership. This reference number is not your ATG Theatre Card membership number. iv. What is a Direct Debit Guarantee and where can I find it? The Direct Debit Guarantee is there for your protection and details your rights as a consumer and can be found on the Direct Debit confirmation letter and in our Terms and Conditions. v. Why does my bank statement state ATG London Limited and not ATG Tickets? ATG London Limited collects payment for ATG Theatre Card on behalf of all venues in the Ambassador Theatre Group. The payee on your bank or building society statement will state: ATG London Limited. vi. What is included in my Direct Debit membership pack? Your Direct Debit membership pack will include confirmation of your annual payment collection date, the amount, and your ATG Theatre Card. vii. How do I cancel my Direct Debit? viii. How do I change the bank or building society attached to my Direct Debit? Once you have purchased your ATG Theatre Card, remember to visit your online account and opt-in to hear from us. It’s important for our members to do this to ensure you receive up-to-date information about your benefits such as priority booking, ticket discounts and monthly newsletters. a. Why am I being charged booking fees if I’m an ATG Theatre Card member? b. What is a restoration levy? ATG looks after some of the UK’s most historic buildings. As such, it’s our policy to include a small restoration levy in the ticket price, which goes towards ensuring these theatres are around for generations to come. This levy helps restore and maintain the facilities within the theatre, such as the toilets or the bars, to keep them as comfortable as possible for our customers. c. Why do you charge booking and transaction fees? This fee is charged on a per ticket basis and the level of fee can vary according to the ticket price. ATG Tickets uses this income to cover the cost of services related to running a ticketing operation including running a contact centre, customer services, technology and developing new services. This fee covers the cost of processing bookings including delivery costs or arrangement for collecting tickets from the Box Office. A portion of the revenue generated by charging these fees helps ATG remain profitable and is invested in running theatres across the UK and worldwide, and producing new shows. You can avoid most fees by either becoming an ATG Theatre Card member (£45 for a year or £35 if you join with Direct Debit and useable across all ATG venues) or by booking in person at the Box Office. i. Who is eligible for concessions*? *If you’re eligible for concessions, you should be aware that (*T&C happiness spoiler*) they’re subject to availability, not valid for all performances, and are ultimately determined venue by venue and show to show. • Students (with valid student ID). • Senior citizens (anyone over the age of 60). • Unemployed (proof that you’re in receipt of JSA is required). • Children. Children under 5 will not be admitted to the Venue except for family shows. Children (ages 18 months -15 years inclusive) shall require their own Ticket which shall be at full Ticket price if no child concessions are available at the time of booking . • Babes in arms (children under 18 months) shall be admitted free of charge to those Events they may attend (children’s shows and Pantomimes only) NB: In our Glasgow theatres (due to theatre licensing laws) we are obliged to allocate a seat to every person admitted to the auditorium, irrespective of age, so although you won’t need to pay for a seat for these 'babes in arms', they will will be officially allocated a seat. Although the seat number won’t necessarily be next to you, by allocating them a ticket they will then be allowed to go into the auditorium with you. • Family tickets: Family tickets are for four people, either two adults and two children, or one adult and three children. These can be selected from the discount link that appears when you confirm your seat selection or (if you’ve been sent an email advertising the offer) you might need to input a promo code. • Groups: head straight over to our Groups page, fill in a form and get chatting to our super Groups Team. • Patrons with access requirements: Please call our dedicated Access line on 0844 871 7677 (Calls cost 7p per minute, plus your phone company's access charge), or our typetalk line on 18001 0871 297 5477. The ATG Access Membership Scheme offers a range of benefits. Click here to find out more and register. • Theatre card members: as a member you not only get a pretty red card and lots of even prettier emails, you also get discounts to a number of productions (plus no booking fees for most our shows). Head towards our Theatre Card page for more information. ii. How do I get my discount? Select it from the discount link when you confirm your seat selection online, or quote your discount over the phone at the time of booking. iii. How do I find out more information about the shows I get Theatre Card discounts for? Find the performance you’re interested in seeing and click on ‘Select Tickets’. If there are Theatre Card discounts, the bottom option will appear. Click 'Login' and enter your Theatre Card membership number there. Some deals only work for some performances, so it’s probably worth checking out a fair few date options to be sure to see if you can take advantage of any available discounts. iv. My discounts aren’t working? • Please check that the dates you’re booking for match the performances the promo code is valid for. • Please check the promo code discount is with ATG and not another ticketing agent. • If you’ve checked all this and it’s still not working, please ring up on 0844 871 7627 (Calls cost 7p per minute, plus your phone company's access charge) and quote the offer to see if it’s still valid. a. What does Access mean? 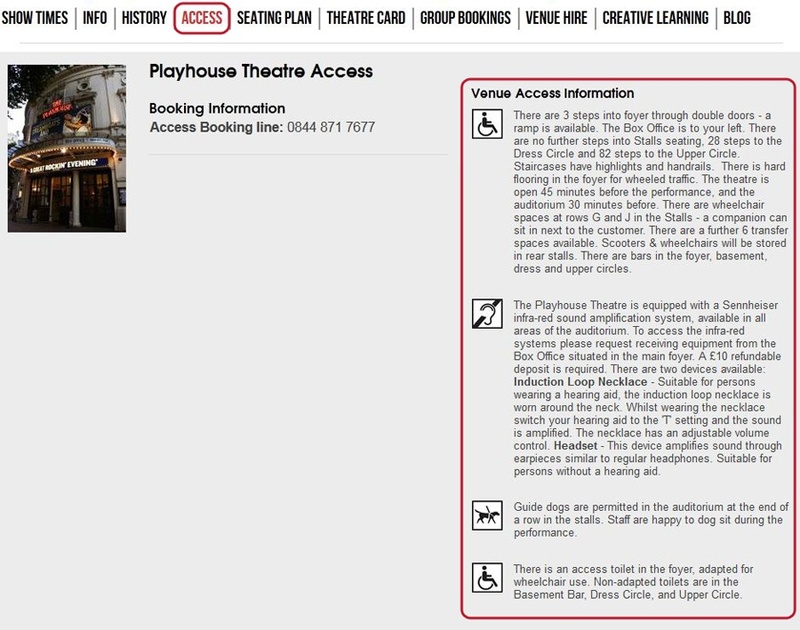 The title ‘Access’ refers to everything ATG does to enable everyone with additional needs or access requirements to come to our theatres and have the best experience possible. If you have any mobility limiations, are hard of hearing, partially sighted or have additional needs of any sort, there might be something we provide that will improve your experience. b. What Access schemes and services do you have? • Wheelchair access into the venue and seating in the auditorium, plus wheelchair transfers. • Signed, captioned and audio-described performances for those with visual or aural impairments. • Guide, hearing and other working dogs are welcome. • Furthermore, anyone who books for these performances is sent a visual story (with detailed information and photos) and is invited to attend an orientation visit at the theatre. • Orientation visits: We offer orientation visits for patrons with access needs. For example, those patrons with autism may want to come with their families to familiarise themselves with the venue, or to identify possible suitable seats for their group. Likewise, those with a visual impairment may want to come and have a touch tour around the set before an audio described performance. • Bespoke services: We can identify a quiet area if necessary and offer an at your seat service for interval drinks, programmes and merchandise. To find out about specific Access facilities available at each venue, please ring our dedicated Access team on 0800 912 6971 (Calls cost 7p per minute, plus your phone company's access charge) or our typetalk number on 0871 297 5477.
c. Who is eligible to receive benefits from our Access scheme and what are they? a. How many people do you need to make a Group Booking? If you want to book 8 or more tickets, please get in touch with our Groups Team via this Groups form. b. What discounts do you get when you make a Group Booking? This varies show to show, but please check out our Groups Page to see some of our most popular discounts on offer, and get in touch with our Groups Team via this Groups form. c. How do I arrange to bring a school group to see a show? Please contact our Groups Team directly via this Groups form. d. Do you do post internationally for Groups Bookings? We do post internationally for Group Bookings. Please note that The Lion King tickets will only be posted out three weeks in advance of the show. a. How do I use ATG Theatre Vouchers or SOLT Tokens on my purchase? In If you are using SOLT tokens on your purchase, please call up our Customer Contact Centre on 0844 871 7627 or go to one of our ATG Venues. If you are using ATG Gift Vouchers on your purchase you can either call up our Customer Contact Centre on 0844 871 7627 book online or go to one of our ATG Venues. Both ATG’s Theatre Vouchers and SOLT Tokens can only be redeemed with ATG at ATG’s UK venues. Click here to see a full list of ATG's UK venues. b. How do I send Theatre Gift Vouchers as a gift to someone? If you buy ATG vouchers online, they will automatically be sent to your billing address. If you want to send them directly to the gift recipient, please ring up on 0844 871 7627 (Calls cost 7p per minute, plus your phone company's access charge). Alternatively, you can buy them in person at any one of our ATG venues. Click here to see a full list of ATG's UK venues.